Upsc upsc website hacked website hacked UPSC Official website hacked - Now Under Maintenance! UPSC Official website hacked - Now Under Maintenance! 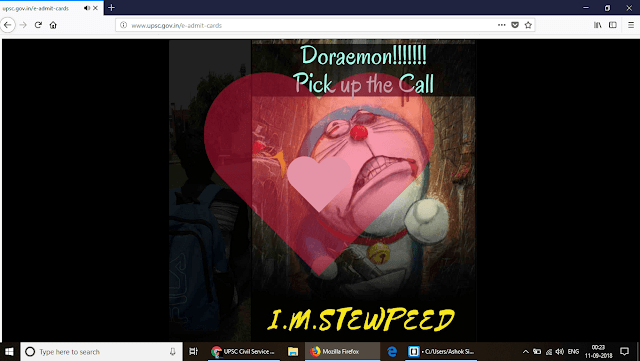 union Public Service Commission (UPSC) website / webpage upsc.gov.in hacked by someone and hacker placed Doraemon picture as front page of the website . The Union Public Service Commission (UPSC) website appeared to have been hacked late on Monday night. The incident came to light when screenshots of UPSC website's homepage displaying cartoon character Doraemon started doing the rounds on Twitter. When the website - http://www.upsc.gov.in - was accessed, it showed a photo of Doraemon along with caption " "Doraemon!!!! Pick up the call". The Hindi title track of the cartoon series was also played in the background. "The website is under maintenance," read the note when the UPSC website was accessed on time of filing this report. There has been no official word on the hacking of UPSC website so far.